First of all, apologies for the photographs, at this time of year it is tricky to get good pictures when the natural light is poor. If you look closely however you should recognise what is essentially a new installation of Cream Porcelain floor tiles. The work was done at a house in Banbury which is a market town in Oxfordshire. Banbury is a significant commercial and retail centre for the surrounding area of north Oxfordshire and southern rural parts of Warwickshire and Northamptonshire. The tiler who laid the floor had used an epoxy grout and unfortunately had not polished off the grout quickly enough after grouting and it was now ruining the appearance of the floor. He now found it impossible to remove the excess residue and was unable to offer a solution leaving the problem to the customer to sort out. 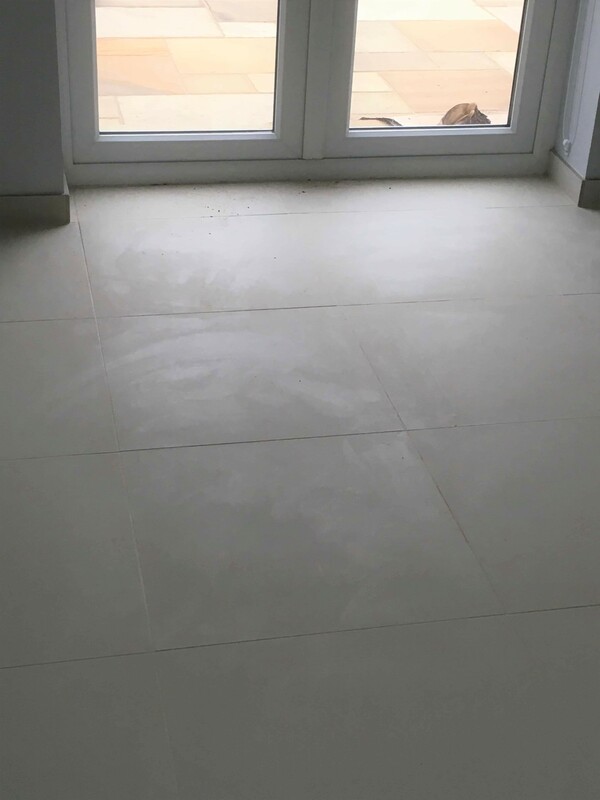 Fortunately, the client found Tile Doctor and having visited the property to survey the floor and assess the correct procedure required to renovate the tiles. Epoxy grout is a superior product to cement based grout and very resistant to staining however it is trickier to work with and often causes problems. We have come across this problem before however so I knew how to treat it and assured the client it could be resolved. The first process was to apply a specialist epoxy grout remover then mix in Tile Doctor Acid Gel, I then scrubbed the resulting solution with a black pad fitted to a rotary machine running at a very slow speed to reduce splashing. The Tile Doctor Acid Gel has a unique pH1 blend of Phosphoric and Hydrochloric acids in a gel form and is perfect for treating grout haze. The floor was then rinsed with water to remove the soil which was then extracted with a wet vacuum. It was a slow process and I worked in sections until the whole floor was clear. There was still some residue in the grout, so I washed the floor with a medium dilution of Tile Doctor Pro-Clean and scrubbed it into the floor using a medium brush fitted on my rotary machine. Last step was to give the whole floor a thorough rinse with water, again using the wet vacuum to remove the water and get the floor as dry as possible. The process took about six hours and when I was finished the Porcelain tiles looked much better. 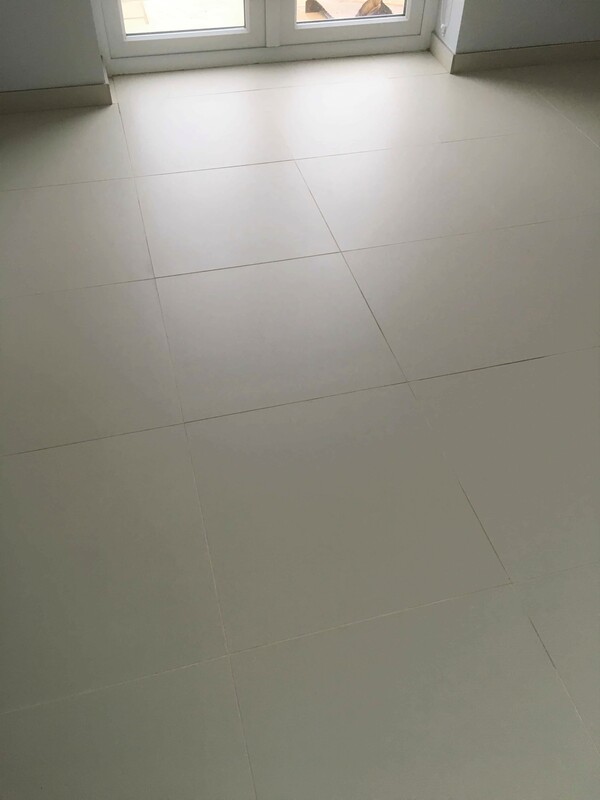 There was no need to add any sealant to this floor as this particular make of Porcelain are not porous and won’t accept it. The client was very relieved to see the floor looking as good as new, it was how the floor should have looked following installation.